So many things go to make a good book, don't they? Characters, dialogue, ideas, perfectly juxtaposed words, pacing, suspense, setting - and that's just a start. But what about films - what makes a great movie? A great director, a brilliant script, imaginative cinematography, a great story - the right stars, good music, fabulous camerawork - and would costume be up there on the list? Up until a couple of weeks ago, when I went to see the exhibition of Hollywood Costume at the Victoria and Albert, I'm not sure it would have been up there. And yet, if you think of the Wizard of Oz - isn't Judy Garland, in that blue and white dress and the red sparkly shoes, one of the first pictures that comes to mind? And which is most familiar to you - the title The Seven Year Itch, or THAT dress? Judy's dress is at the exhibition, as is Marilyn's. Batman, Spiderman and Catwoman lurk disquietingly above eye level. Meryl Streep is there, in the guise of Margaret Thatcher, Karen Blixen and Donna from Mama Mia. Sharon Stone crosses her legs as she gazes into the camera. Brad Pitt pops up all over the place. 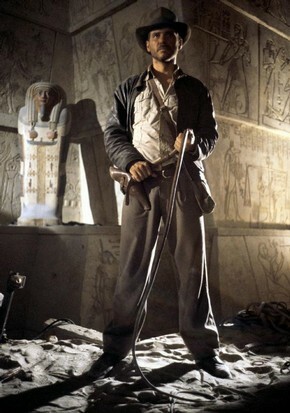 Harrison Ford unfurls his whip: Darth Vader looms and Ming the Merciless glowers. Elizabeth 1 stands proudly in all her regal splendour, as played by Bette Davis, Judi Dench and Cate Blanchett. Alfred Hitchcock's icy blondes, in their tailored suits and elegant court shoes, stagger beneath the onslaught of birds and knife-wielding shower freaks. Jack Sparrow swaggers in his raffishly romantic coat and enormous hat. But it's not just a series of tableaux - far from it. There are commentaries from directors, designers and stars, and we begin to see that the costumes we eventually see on screen result from a network of discussions and input from all three. The shape of Indiana Jones' hat, for instance, was based on the design of authentic western stetsons - but the shape was altered to suit the shape of Harrison Ford's face, and the tilt of the brim changed so that his eyes would be visible to the camera. 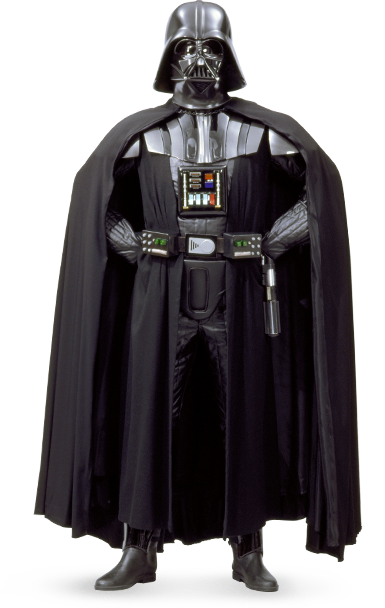 Darth Vader's iconic costume, on the other hand, developed from a root around in the props store; someone surfaced with an old gas mask, a steel German helmet and a voluminous cloak - and there you have it, a legend was born. There was a sumptuous display of costumes from historical dramas. Elizabeth 1 featured strongly. From the 1939 film with Bette Davis, The Private Lives of Elizabeth and Essex, there was a gorgeously elaborate red velvet number. It was copied from a contemporary portrait; the designer was completely faithful to the original, and every detail was precisely rendered. Designers in more recent films have taken a slightly different route; they've done the research too, but they've allowed other factors to come into play; in Shakespeare in Love, for instance, there's an element of playfulness and fantasy, and in Elizabeth, starring Cate Blanchett (right), the costumes are used to accentuate the state of the character as she changes and develops. So they look authentic, and they tell us something about what's going on in her mind, but they are not exactly as Elizabeth would have known them. Mostly, I was fascinated by this exhibition for its own sake - this is just a tiny glimpse of the treasures it has on offer, and it's staged most cleverly - but it did strike me that there was a relevance here to writing historical fiction. We often discuss and agonise over the issue of accuracy; we're on painful tenterhooks in case an anachronism sneaks underneath the radar. And of course for our own satisfaction and because we owe it to our readers, we're always going to strive for authenticity. But we are creating an artefact, which has many different aspects which work together to create a certain whole. What we create will never be a simulacrum of the past; it's a fiction, an illusion. So, I just wonder: maybe this is a touch heretical - but perhaps we shouldn't worry quite so much...? Lovely post! I feel almost as though I'd visited the exhibition myself! It is amazing and well worth a visit. The conversations between directors and their costume designers were so enlightening-extremely clever and formidable women, most of them! All the historical costumes were so wonderful. I plan to go back! Yes, I wish I lived near enough to pay another visit! Great images - and I thought your points in the last paragraph were well worth pondering - thanks!